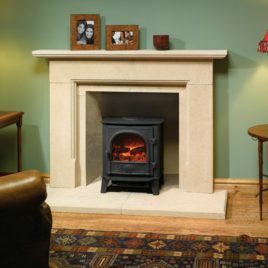 The fine castings of the Huntingdon Electric range are brought alive with Gazco’s VeriFlame™ technology, which gives you two heat settings that can both be thermostatically controlled. In addition, there are also three flame brightness levels to choose from as well as the option of a blue flame effect on the highest heat setting. 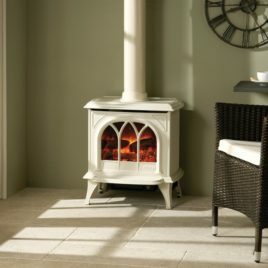 Your choice of flame effect is set against the highly realistic fuel bed and individually hand painted logs, perfectly mirroring the look and atmosphere of a real wood burning stove. 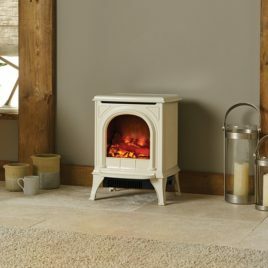 The Huntingdon Electric range is available in a number of finishes to complement your home. For even more styling options, each size is also offered in either clear door or tracery door versions. 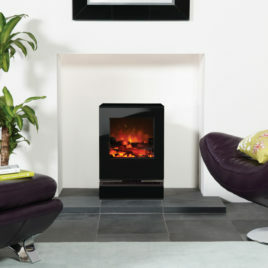 The Gazco Marlborough electric stove offers you an amazingly realistic log-effect fire at the touch of a button. At its heart is Gazco’s unique VeriFlame™ technology which allows you to choose from two heat settings that can both be thermostatically controlled*; three brightness levels, plus the additional option for a blue flame-effect on the high setting so you can match your mood exactly. You can even turn off the heat and just watch the stunning flame-effects. 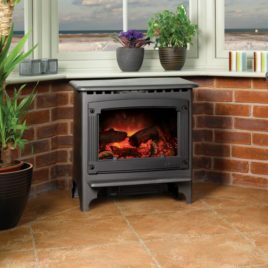 Gazco Electric Stoves simply plug into a 13amp socket, so are particularly suited for conservatories, bedrooms or home study, in fact any room without a chimney. 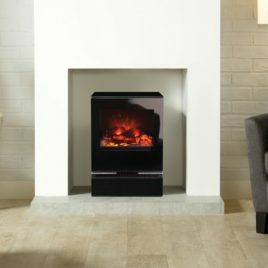 The Gazco Vision is a contemporary, electric stove that comes in three sizes: Small, Midi and Medium; each sporting a highly reflective black glass door, integral glass plinth, black glass top plate and contrasting stainless steel detailing for a clean stylish look. Incorporating an eye-catching flame effect created using Gazco’s unique Veriflame™ technology, the Vision’s alluring visuals glow over a realistic hand painted log-effect fuel bed to give all the ambiance and depth of a real log fire. The three brightness levels can be easily altered with just the touch of a button on the remote control. There is even a blue flame-effect setting that adds an extra visual dimension to the highest of the brightness levels. 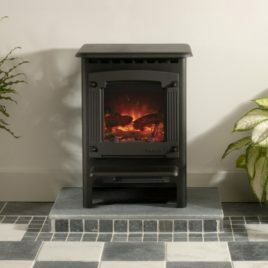 With a stunning cast iron door and heavy gauge steel body, the Gazco Stockton electric stove combines the classic looks of a wood burning stove with the ease and convenience of Gazco’s unique VeriFlame™ technology. This means you can enjoy two heat settings that can be thermostatically controlled*, three flame intensity levels, plus the additional option for a blue flame effect on the high setting to create a remarkably authentic log-effect fire – a superb focal point for any room. 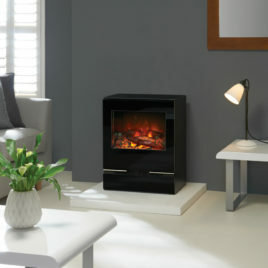 The fan heater is discreetly hidden beneath the stove and can be adjusted by remote control. 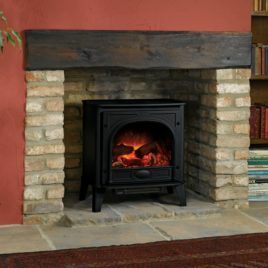 The Stockton 5 is also available in a woodburning/multifuel version or a gas version. 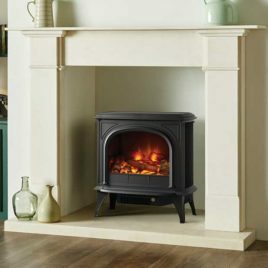 With a stunning cast iron door and heavy gauge steel body, the Gazco Stockton electric stove combines the classic looks of a wood burning stove with the ease and convenience of Gazco’s unique VeriFlame™ technology. This means you can enjoy two heat settings that can be thermostatically controlled*, three flame intensity levels, plus the additional option for a blue flame effect on the high setting to create a remarkably authentic log-effect fire – a superb focal point for any room. 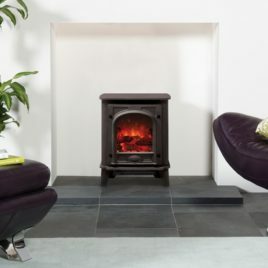 The fan heater is discreetly hidden beneath the stove and can be adjusted by remote control.